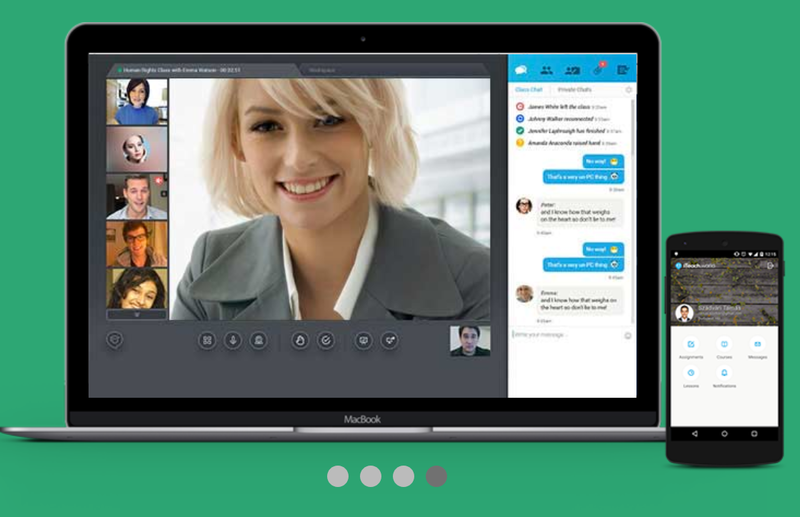 SmallTalk has to be one of the easiest ways of creating and sharing audio and voice communications with your students. It’s a simple plugin for the Chrome browser that allows you to record directly into your Gmail messages. Simply open a new message and click on the icon in the bottom right. 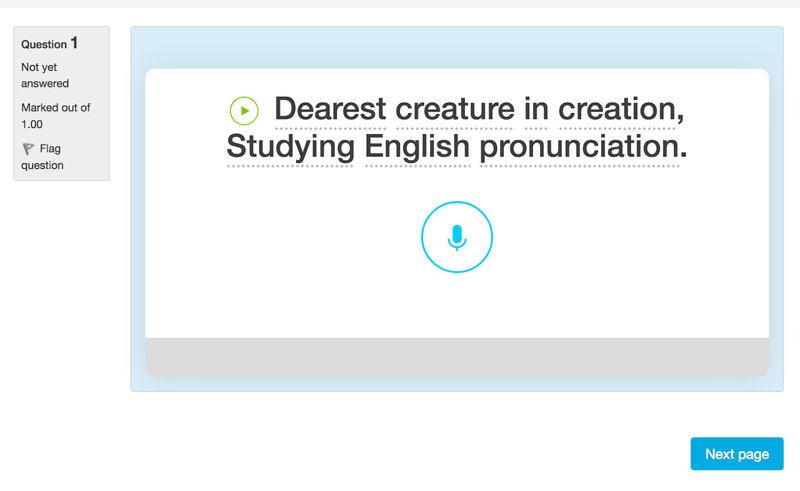 Click the tick when you have finished speaking and then just send the message off to your students. 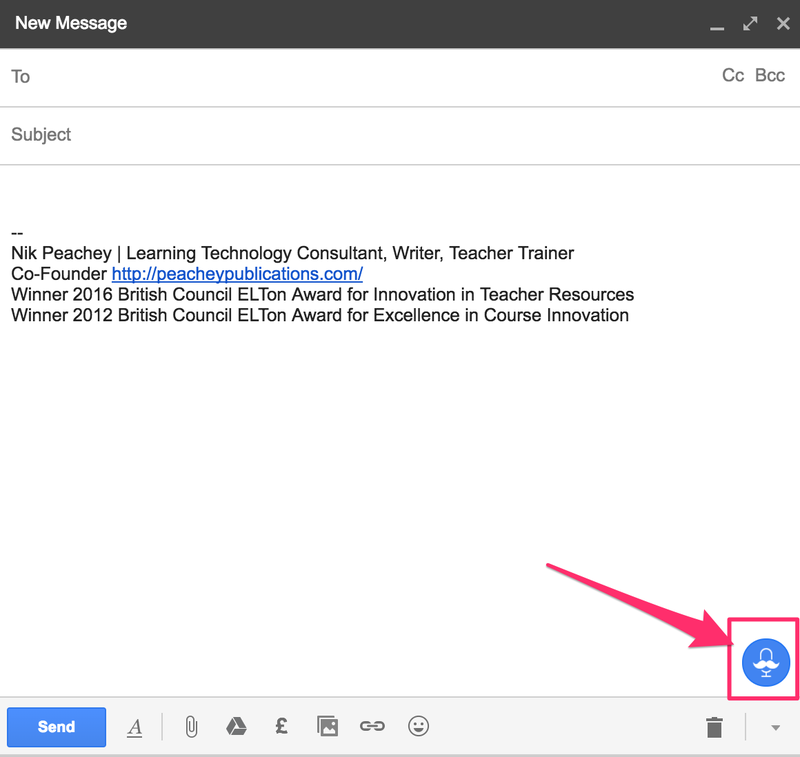 Students who receive the message don’t have to be Gmail users. 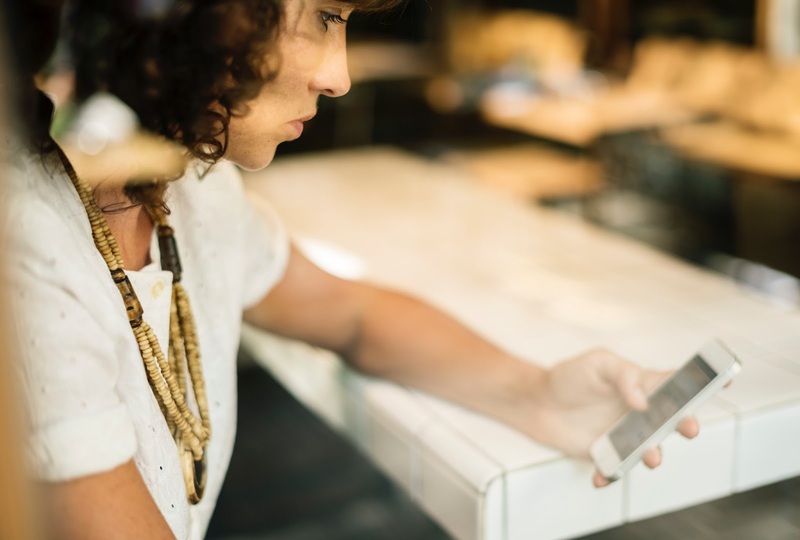 They receive your email message with a link to the audio file that they can play directly from the message or they can download and play the message. This is a really simple way to create audio that can be used for a wide range of activities. 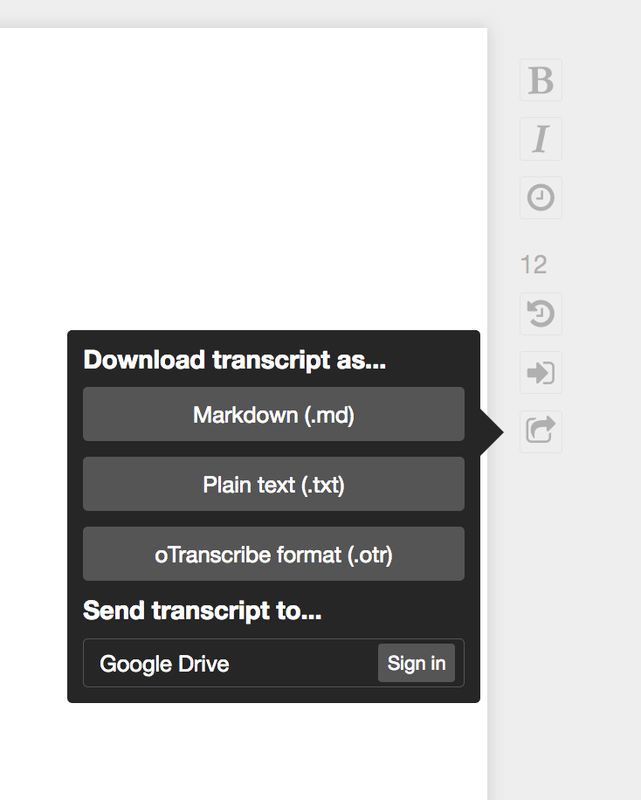 You can record a dictation text for students to listen to and write down. You could then get them to record it and send it back. You can send students audio notes from your lesson. This could be a summary of new vocabulary and include models of pronunciation, or could be models of example sentences or language chunks students have been working on. Alternatively you could use it for communication and get students recording learning journal entries that you can respond to. 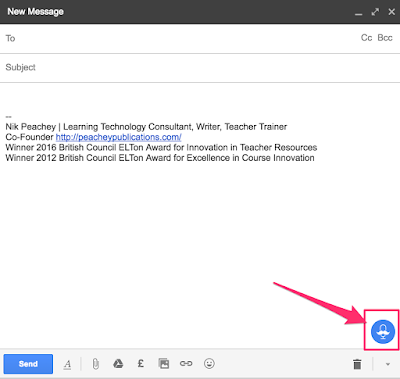 If students have access to Gmail and can use the recording tool themselves you could start a Q and A session with them to get them asking and answering questions. Instead of sending students written comments about their homework you could send them an audio file for them to listen to. SmallTalk is a really simple to use free tool that can save you time and enhance your teaching and students’ learning. You can find 100 + more tools and resources like this in my ebook Digital Tools for Teachers - Second Edition or if you want to train other teachers to use these kinds of tools check out the Teacher Trainers’ Edition. Strangely enough I had my first experience of Virtual Reality in a bar in Barcelona about twenty years ago. As I remember I put on a headset and then had to jump from one rock to another as I navigated my way through what looked like some kind of virtual meteor shower. About ten years later I had an office in the 3D Second Life virtual world and was designing business English classes and running an ELT chat show. Now another ten years on VR seems to be making another surge into the mainstream consumer market and the field of education. Whether it’s here to stay or not largely depends on how accessible edtech companies can make this to mainstream teachers and classrooms around the world and the ability of edtech companies to provide experiences that have genuine educational outcomes that match the kind of investment that will be necessary to enable students to access those experiences. 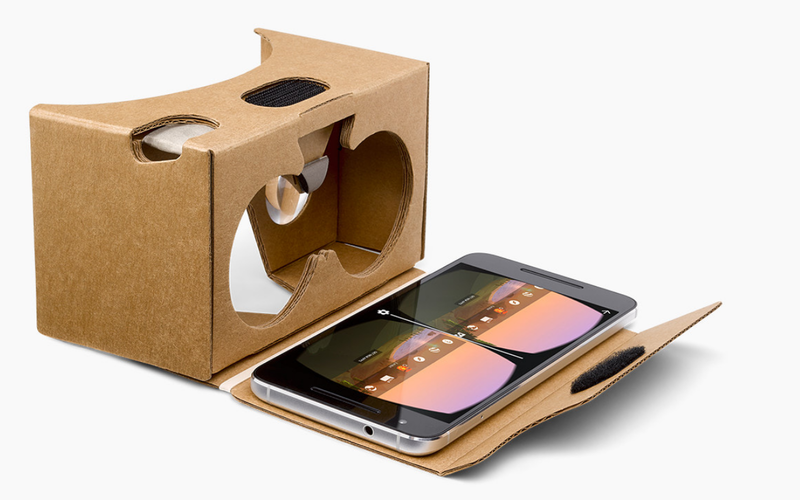 Google have made a great start with Cardboard (a cheap and easy to assemble VR headset that can be used with a mobile phone) but Cardboard is still a long way from being able to provide the kinds of immersive and interactive experiences that come with the much more expensive Vive and Oculus type devices. Anyway, in an effort to help you navigate and get involved with this new wave of virtual reality I’ll be writing a short series on what’s out there and available for teachers and educationalists to get started with, so here are the first six tools for creating VR experiences. Edorble is a great tool for setting up your own 3D virtual classroom. You and your students have to download the software and then you get a code to enter your own virtual world. 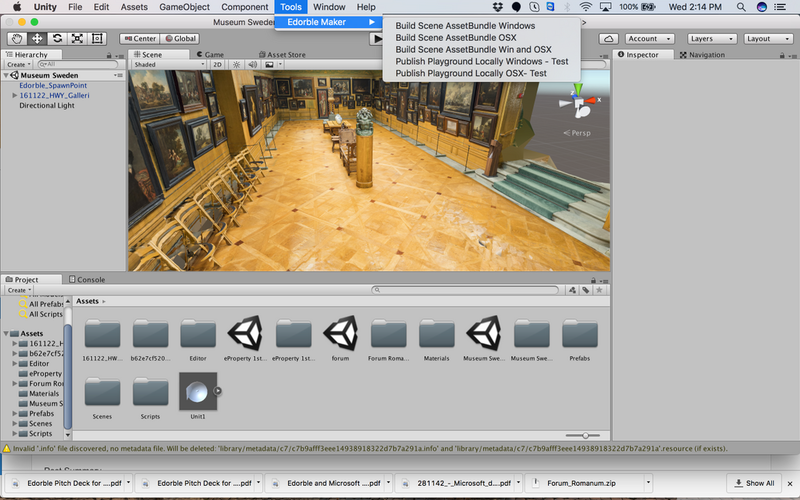 Give the code to your students and they can enter your virtual world too. This gives you and island auditorium where you can show videos, collaboratively share and view links to websites and chat using proximity sensitive voice chat. 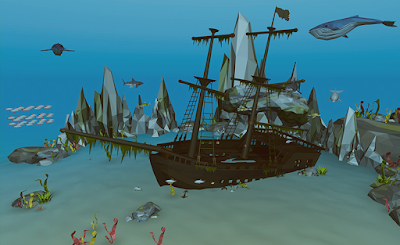 You and your students can also roam around and explore the rest of the environment. There is also a version for VR headsets. 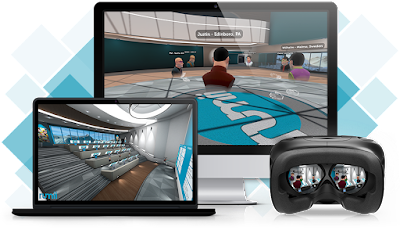 Rummi is a 3D virtual meeting space for meetings of various sizes. You need to create an account and download the free software. You can then create your avatar and create various size rooms depending on how big your meeting is. These rooms vary from small meeting rooms to larger auditoriums that can host panel type debates with a group of speakers and a larger audience watching. You can use this with an ordinary laptop or desktop screen or with a VR headset and controller. 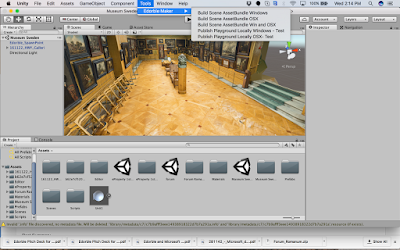 This is a wonderful tool for constructing interactive 3D virtual reality spaces. You can register and then either customise a pre-constructed template environment or create your own from scratch. You can add a range of interactive features to the environments such as hot spots that link to other materials or content, video screens, interactive 3D models, 2D texts. 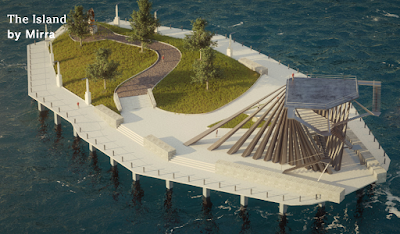 Once you have finished building you can publish your environment and allow people to visit and interact with it. This is a great way to build VR experiences that can be viewed in the web browser either with a standard screen or VR headset. This is a great resources for getting kids to create their own interactive 3D spaces and creations. 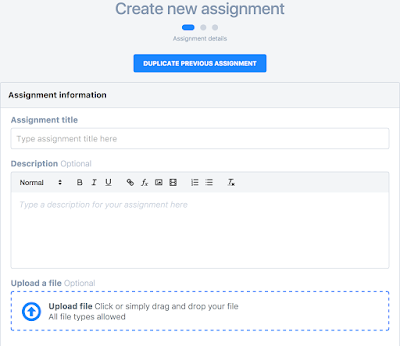 If you register as a teacher you can create classes and assignments then add your students to the class and set them the assignments. Students get a code to enter your class and can then create virtual spaces. Check out some of the examples to get some idea of what is possible. Students can browse or create these using a standard screen or VR headset. 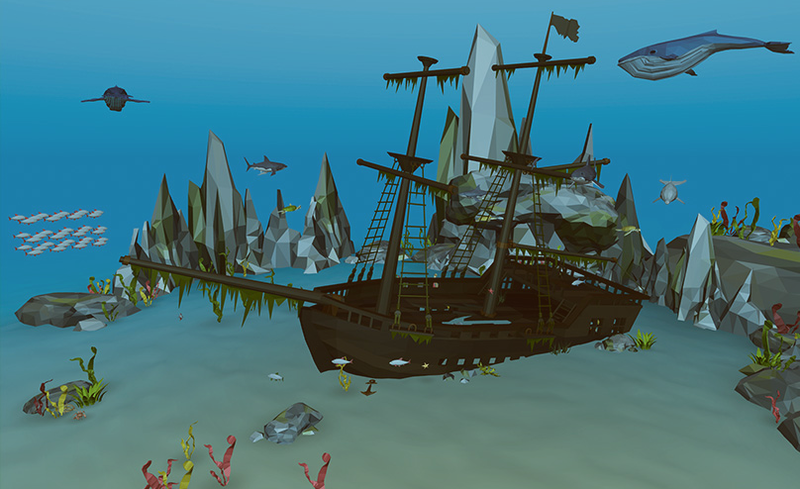 Engage is also for those who want to take their VR pretty seriously and create virtual reality educational experiences. The Engage platform is a free to use social education and presentation platform. 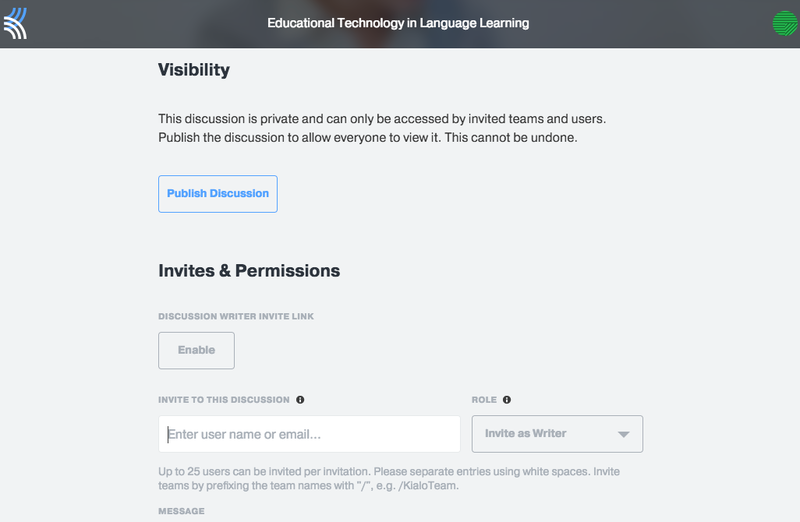 Engage allows you to hold meetings, classes, private lessons and presentations with people from all around the world in a safe virtual multi user environment. 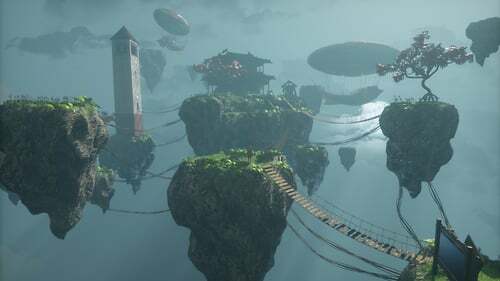 Like Sansar the software is free to download (You’ll need a high spec PC though) and with it you get all the tools you need to build virtual world experiences. Engage was really designed for the virtual delivery of live and recorded presentations and experiential distance learning for up to 30 students in a class. I hope you enjoy getting started with VR and look out for part 2 soon. 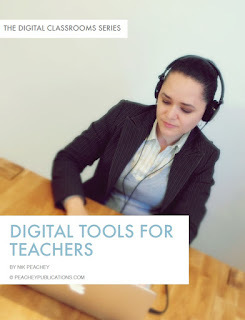 You can find 100 + more tools and resources like these in my ebook Digital Tools for Teachers - Second Edition or if you want to train other teachers to use these kinds of tools check out the Teacher Trainers’ Edition. This is an amazing resource for finding genuine audio examples of words and phrases in seconds. FluidDATA is really simple to use and delivers fast results. Simply type in your word or expression and the search engine will produce a list of web-based audio files where the phrase appears. It will also show you the written context the work appears in. 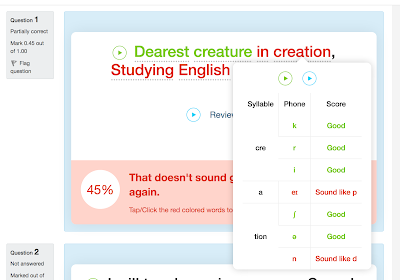 This is an amazing audio corpus that you and your students can use to study the lexical use of words and phrases as well as variations in pronunciation. 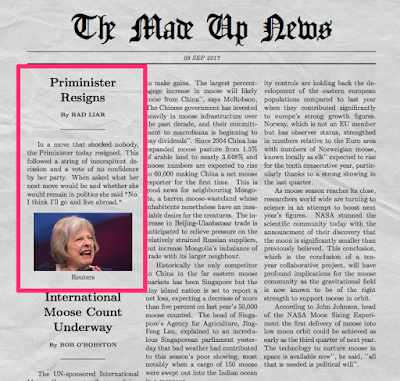 Get students to find examples of language points and vocabulary they are studying and deduce meaning from context. 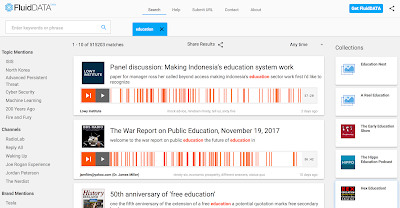 The site also shows you the source of the audio files so this has the added benefit of helping your to find useful open access podcasts on any topic you may be interested in. FluidDATA is a fantastic free resource for any linguist, teacher or student of English. Transcribing audio scripts is a challenging and very useful ‘bottom up’ listening activity which pushes students to accurately identify word boundaries as well as the full range of English sounds and features of connected speech. http://otranscribe.com/ has a very useful interface which can help students to transcribe any audio or video file. 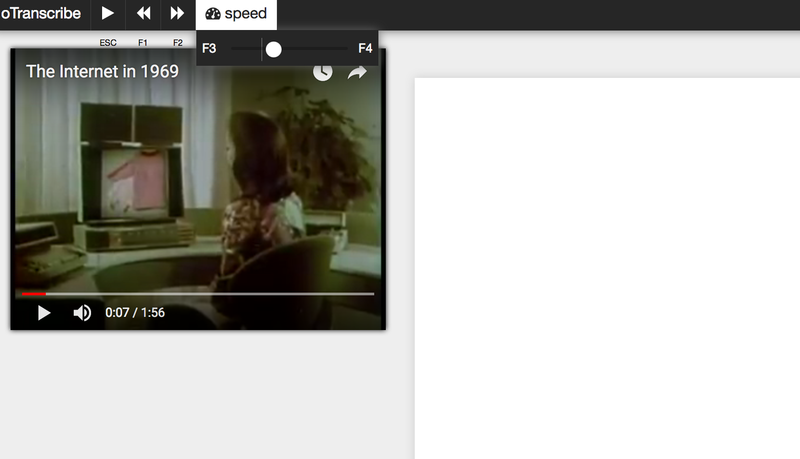 Just add a link to the video or upload ad audio and the file will open in the interface. The file opens to the left of your text area and includes play and pause controls as well as a speed control for speeding up or slowing down the play back. 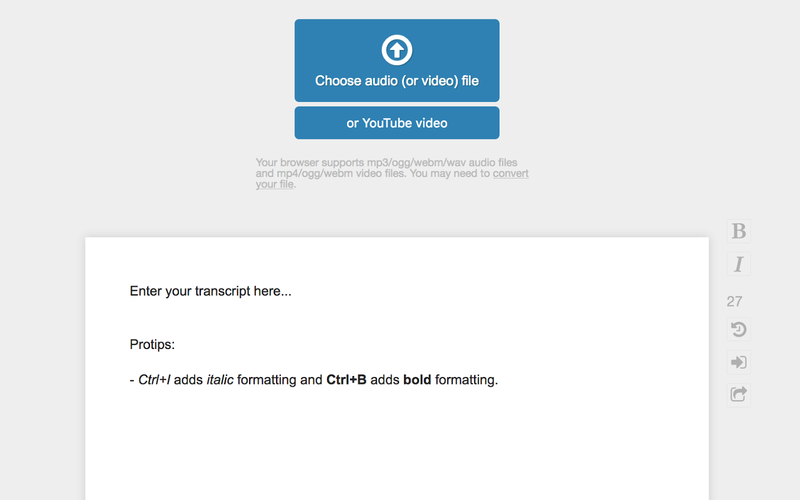 Once the file is open students can just listen and transcribe the text without any switching of windows, tabs or applications. 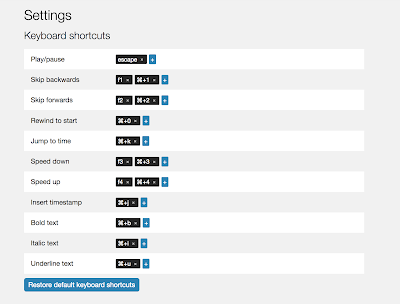 They can add time stamps to each line to sync with the audio file and there are a number of keyboard shortcuts to make the process more convenient. Once students have finished they can export the file or save it to their Google Drive and share it with you or their peers for feedback. OTranscribe makes transcribing much more convenient. This is a great way to review audio or video content that students have already studied for comprehension purposes. 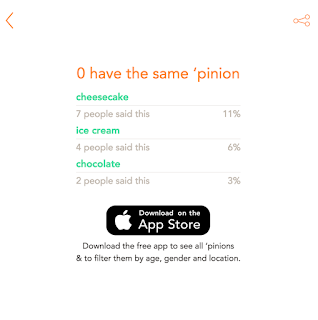 This is a simple site with both iOS and Android apps that enables students to share and compare opinions. Pinion has a range of images each one with a gapped sentence on. 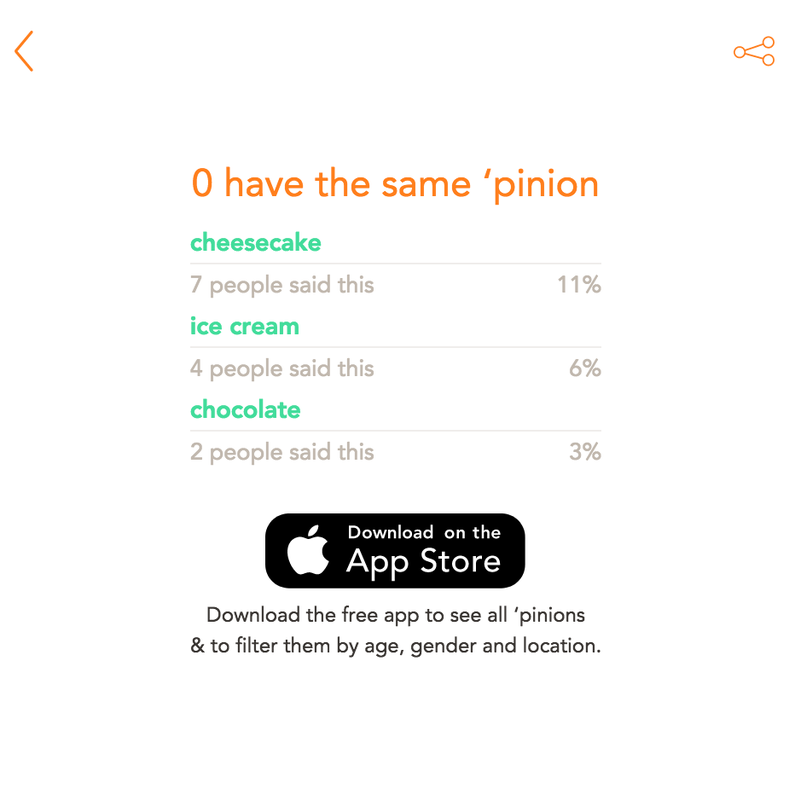 Students can complete the sentence any way they choose to share their opinions. The opinions can also be posted through social media, so this can work well if you have a Facebook Group too. Once they enter their opinion students can see what other people have posted. This is a great way to stimulate quick discussions and an idea that you can easily replicate in the classroom with images. This site is best suited for adult learners as some of the sentences related to alcohol and other more mature topics, so be sure to check for suitability. I hope you enjoy using Pinion with your students. 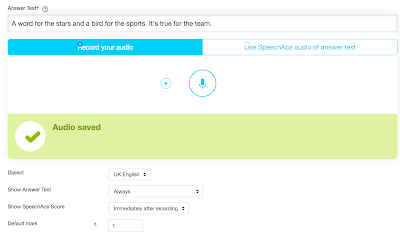 SpeechAce is a great Moodle plugin for anyone who wants to build speaking and pronunciation activities into their online course. The plugin allows you to build tasks and activities into your Moodle course that require a verbal response, these can be listen and answer, listen and repeat, watch multimedia and answer, and which gives students useful constructive feedback on their pronunciation. 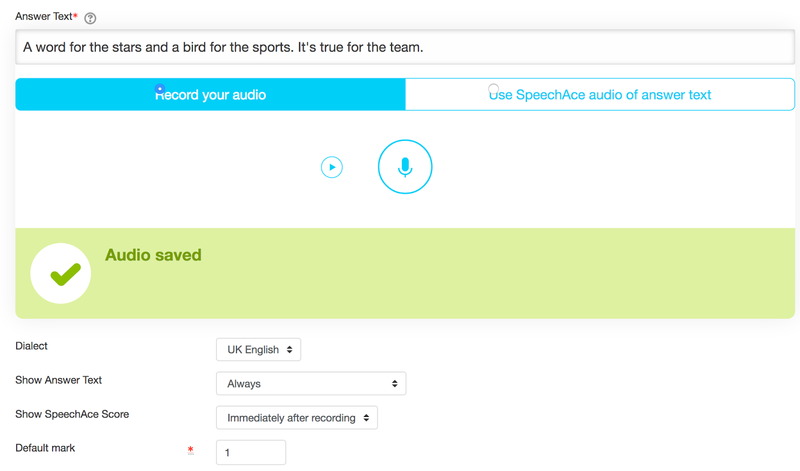 Students simply click to record their answers or input, this can be the answer to a questions or can be based around a text they have read or a recorded model (UK or US accent) they have listened to and tried to imitate. They then they get a score and an analysis of their answer. They can get word by word feedback on their performance and see which phonemes they produced successfully and which they still need to work on. 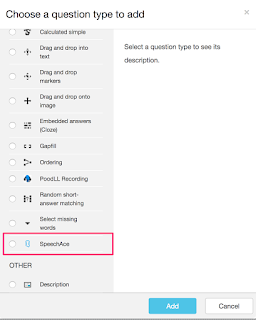 Installing the plugin is pretty simple and then you just select it from the main tasks menu whenever you want to add a speaking activity to your course. If you build it into a tutored course the students scores are recorded in the grade book and teachers can go and listen to their recordings too. This can really make teaching preparation effective in a blended learning course. Like many teachers and language course designers, I’m usually pretty sceptical about a computers’ ability to evaluate student speaking, especially given the range of variation in native speaker output, but I think SpeechAce does a really good job of getting students to produce language, giving them feedback on their performance and encouraging them to listen and try again. 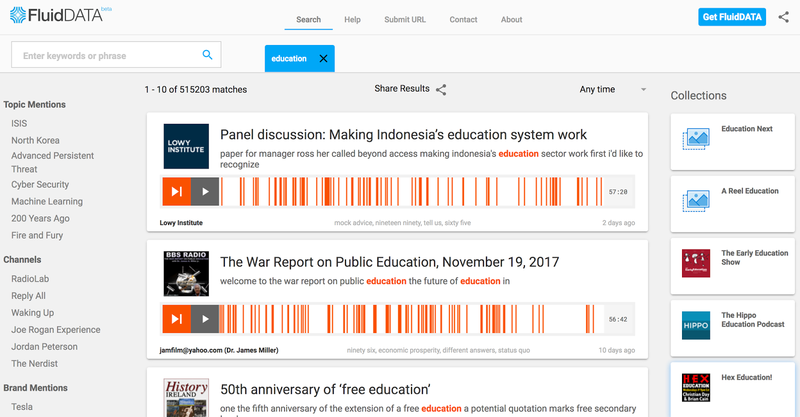 Building this kind of capability into an online language course, especially a MOOC type one that has much less teacher contact, could really help students to stay motivated and engaged for longer. If you want to give it a try as a teacher then go to: https://playground.speechace.com/moodle/ where you can get access to the SpeechAce sandpit. If you want to try it as a student then go to: www.speechace.com/pc and you can try a demo placement test. 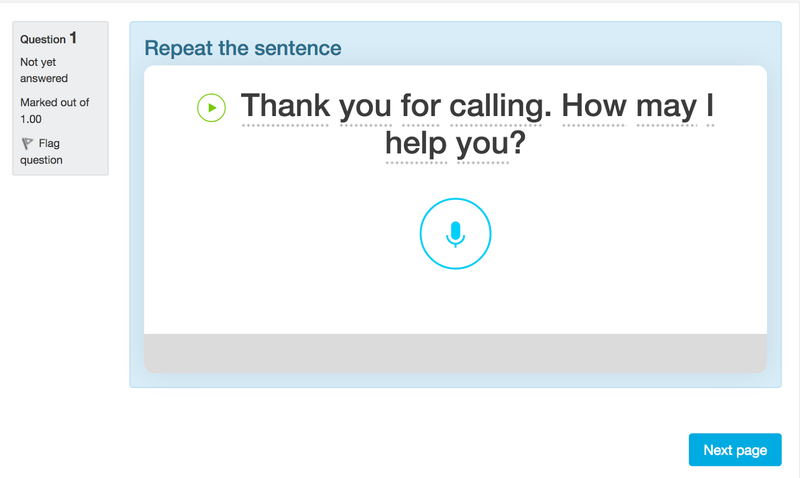 I’ve known about SpeechAce for a couple of years now and it’s great to see how it has developed. It isn’t free (there is a free trial), but the company is clearly putting their money into developing a constantly improving product and I think that’s something worth supporting. 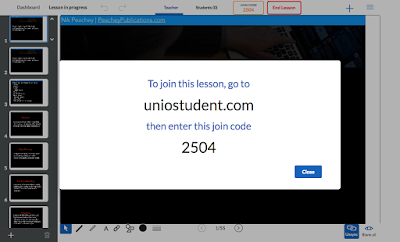 Unio is a great tool if you want to ditch your course book and make your lessons paperless and media rich. It’s a very easy tool to use. You can set up courses just by clicking on the cross in the top right of screen. Once you have created your course topic, adding and editing lessons is simple. Once the editor is open you can upload ready made presentations in multiple formats and add interactivity to them or create the lesson by adding individual elements and interactive learning objects. 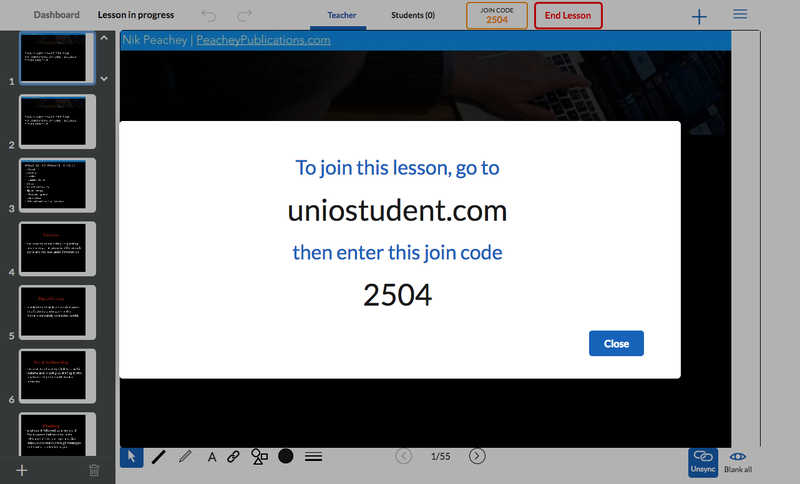 Once the lesson is created Unio is really simple to use. You just launch the live session and any student can then log in to the lesson with just their name and the class code. Unio works in the web browser so will run on any device regardless of the operating system, so it’s ideal for the BYOD classroom. Once students have the lesson open on their device they can use the tools to annotate it, answer polls, watch videos or if they have questions they can send them in to the teacher. As the teacher you can control which slide they are seeing or you can ‘unsync’ the presentation and allow them to browse. When the presentation is ‘unsynced’ students can watch any video or media clips independently on their own devices rather than collectively on your main presentation screen. This is great if you want students to watch or listen at their own pace. 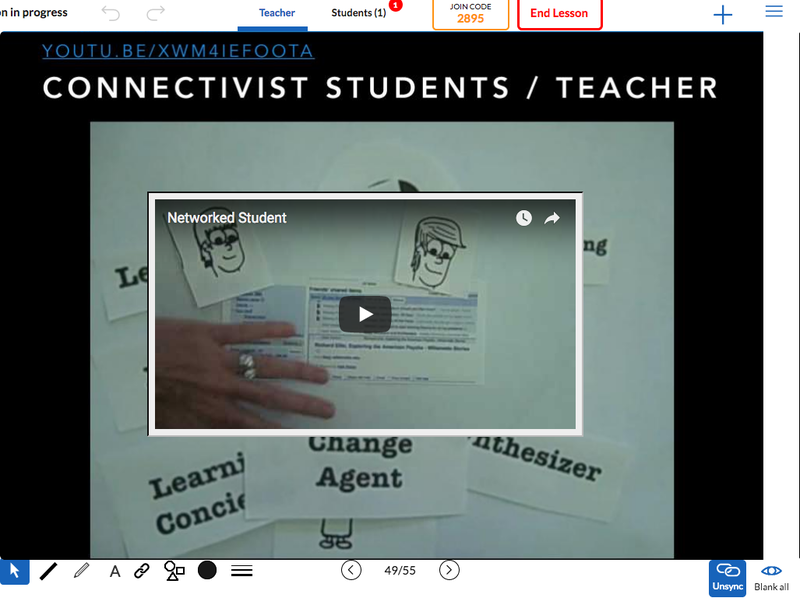 When you finish a live lesson you can leave it open for students to browse and work through independently, so there is potential to use this for a flipped learning approach too, or you can use it for 100% online classes instead of screen sharing (and save a lot of bandwidth). 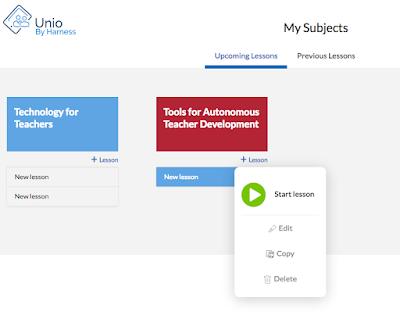 Unio is a freemium product, but the free version is very usable and the if you want to upgrade and use this at a school level then it’s still very reasonably priced. Unio has huge potential for the digital classroom and is a great way to keep devices, fingers and minds occupied and working in a constructive way. 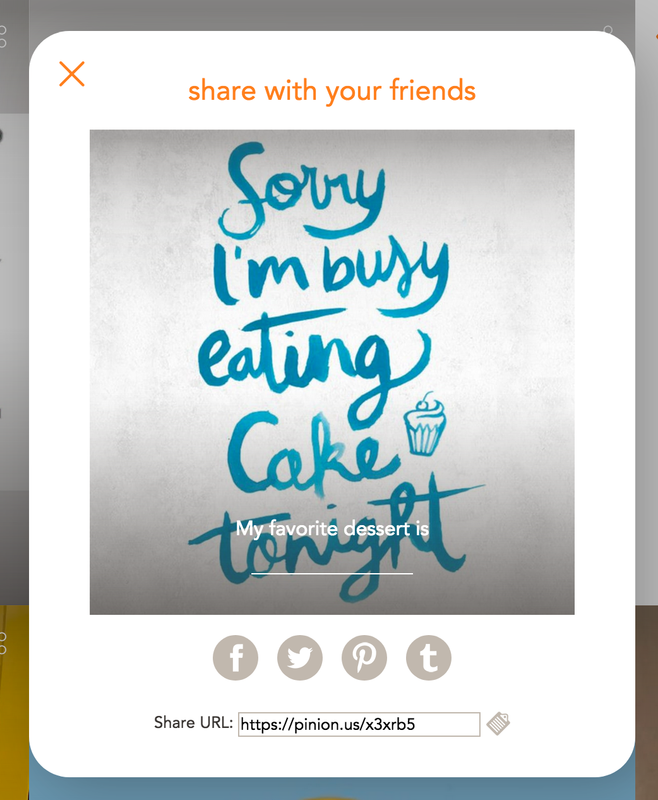 I hope you enjoy using Unio and your students find it rewarding. 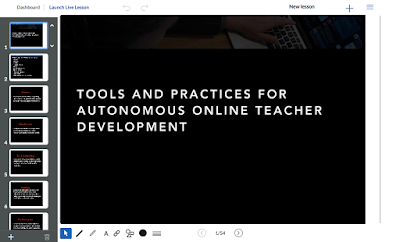 You can find 100 + more tools and resources like this in my ebook Digital Tools for Teachers - Second Edition or if you want to train other teachers to use these kinds of tools check out the Trainers’ Edition. 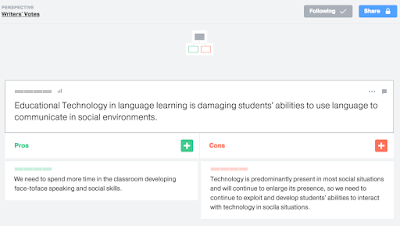 Kialo is a wonderful tool for developing critical thinking skills and to develop students’ abilities to look at and explore multiple perspectives of complex issues in a clear and logical way. 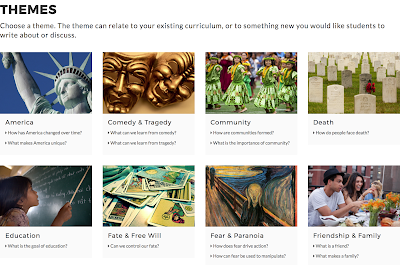 The site enables teachers to set up complex topics and structure ‘pros and cons’ type debates around them. This is simple to do. 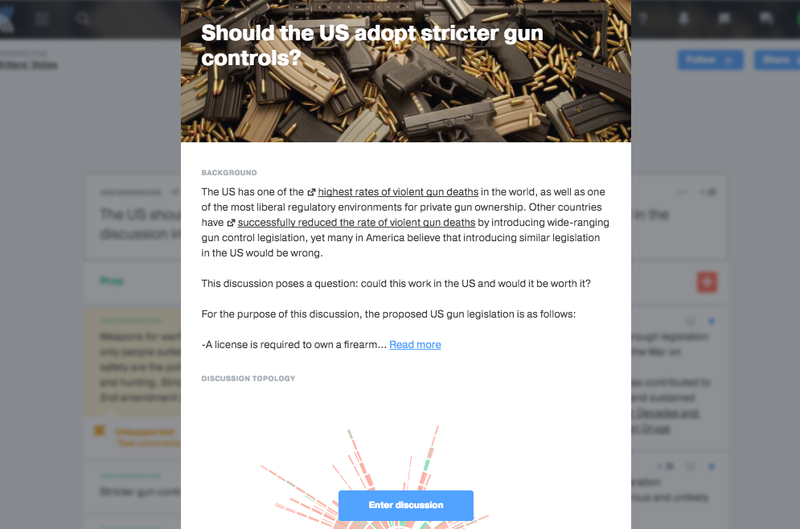 Just set up your topic, add an image and some explainer text that you want students to read first and then invite students to add either pros or cons. 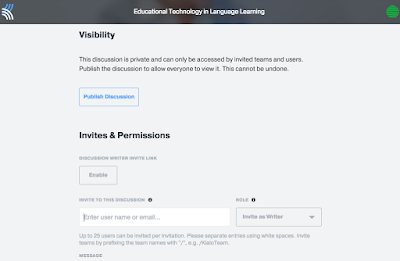 You can keep your debate topics private and only allow your own students to add to them by creating teams and then sharing different discussions with the team, or once you have 15 comments you can then publish them and open them up to the public. This process of collecting a reasonable number of comments before going public helps to ensure the quality and integrity of the discussion content already on the site. Once you have created a team you can also share any of the existing debates with your students too. 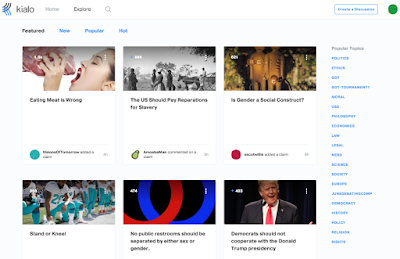 This is a great place to get your students thinking in a structured and logical way about complex topics and is a great way to prepare them for a classroom debate or discussion. 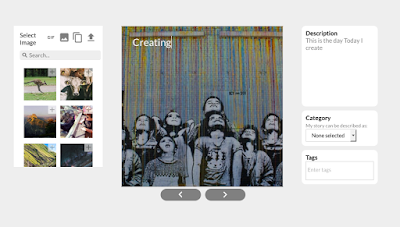 The discussions have been categorised into topics to make them easier to browse. 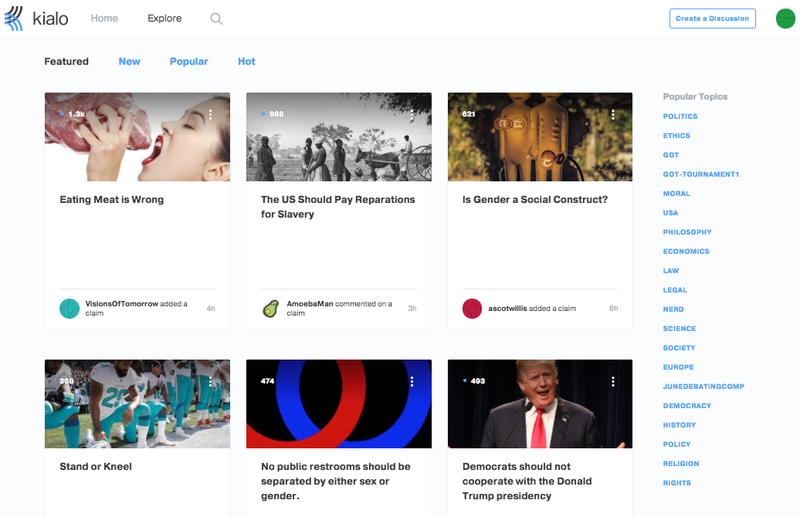 A lot of the existing content has a very strong US bias, but there are still quite a few internationally relevant topics if you don’t want to create your own. I hope you enjoy using Kialo and your students find it rewarding. You can find 100 + more tools and resources like this in my ebook Digital Tools for Teachers - Second Edition or if you want to train other teachers to use these kinds of tools check out the Trainers’ Edition. I’m really proud to announce the release of the second edition of my Digital Tools for Teachers ebook and also the Trainers’ Edition which should enable any teacher with a basic knowledge of technology to run teacher training and development courses and sessions for pre-service and in-service teachers. The two ebooks are available for both iOS/ Apple devices as well as in a PDF version that can be used on any reader, smart phone or computer. 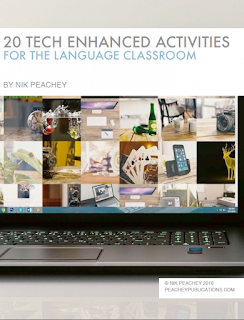 The Second Edition of Tools for Teachers contains a new chapter on games and gamification with X links to games and game type resources that you can use with your students to develop their language skills. 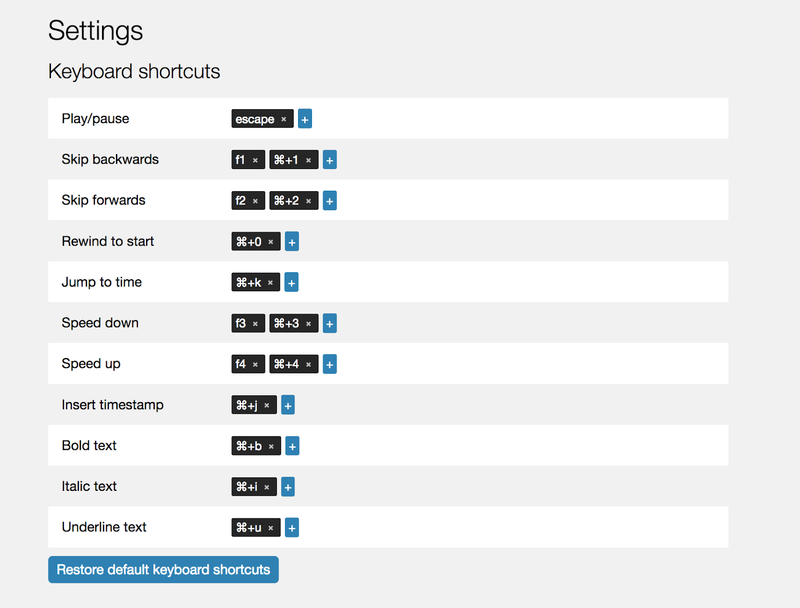 In addition to this the other chapters have had some 30 additional tools added. The teacher trainers’ edition includes all the extra materials mentioned above as well as 3 additional chapters to enable any teacher to use the book for teacher training and development purposes. These chapters include tips and advice for trainers, more than 20 teacher training activities that exploit the resources in the book and a chapter on digital tools for trainers that can enable them to deliver paperless digital training sessions. I hope you find these books useful and they help you to develop your own teaching and the teaching of others as well as the learning potential of your students. I’d like to share a short series of articles I have produced for the Cambridge University Press blog - World of Better Learning. The series looks at the impact of digital technologies on classroom practice and the kinds of skills teachers need to ensure that they help their students to take advantage of the opportunities that increasing classroom access to the Internet can offer. In this first article I look at how classrooms are becoming increasingly digital and how this impacts on how we manage classroom interaction and the tools we use to do this. In this article I look at how we can leverage digital devices in the classroom to make writing activities much more collaborative and engaging. In this article I look at how we can use web based tools in the classroom to push more autonomy and learning responsibility onto students. In this article I look at how we can use technology to encourage our students to become creative producers or web content rather than passive consumers. In this article I look at how we can use QR codes to make more of our worksheets digital and accessible on our students’ mobile devices. In this final article I look at how we can use technology to take control of our own learning and development. Over the last couple of months I've found and written about a number of really great tools and resources to help improve our students' writing skills. This is a collection of links to reviews of ten of the best. 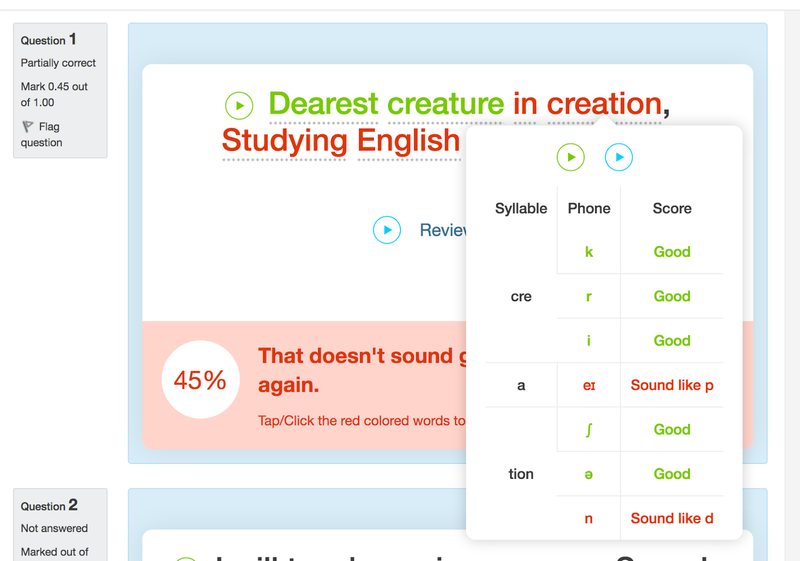 This site was designed to help grade K5 - K12 native speaker students develop their reading and comprehension skills, but can also be really useful for second language development. Students can choose from a range of graded texts and get a wide range of interactive activities and reading support. 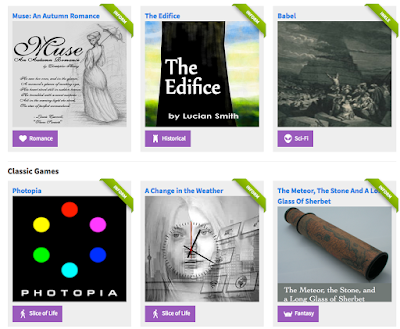 Teachers can also register on the site and assign specific texts to their students. As a teacher you can create classes and assign writing tasks to students. The students do their writing tasks within the platform and can publish and share them there. This is a little like posting to a blog, but within a safe environment. 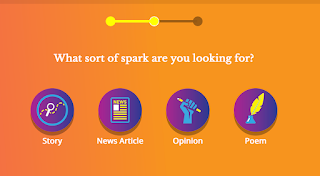 This app is based around a common classroom activity in which students write stories together by adding a sentence and passing it on to another writer. The next writer then adds a sentence and either passes it back or passes it to another student. The process continues until the story is finished. This app is also social so users can comment on, follow and like each others creations.I used the app to create an illustration of a poem by Robert Frost - Fire & Ice. This would be nice activity to do with students, either selecting or letting them select a poem to illustrate. Text adventure games are a great way of really engaging students in reading. They get the chance to take some control of the narrative and find their own way through the story by making choices at various points in the narrative. Story Wars is a great gamified way to make writing creative and competitive. Students read short chapters of the beginnings of stories and then have to submit the next chapter for the story. 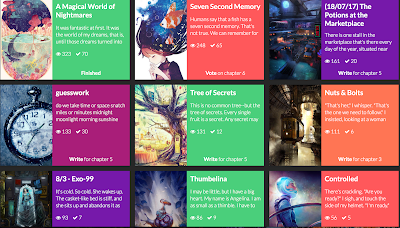 The readers of the story can then vote for which new chapter they feel is the best continuation of the story. The one with the most votes becomes part of the story. 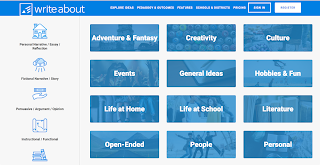 This is a great site for giving structure and adding an element of fun to writing activities, especially if you have a data projector so that students can see the prompts on the screen. I hope you find these reviews useful and that they help you to choose the right tools and resources to help your students.